One of my pet projects of late has been to start digitally archiving a photo album that came into my possession late last year. This particular album contains some beautiful late nineteenth century carte de visite and cabinet card photographs relating to the Auld family, taken by photographers in Scotland, England and Australia. In due course I will be sharing the collection online for all to see. On the back of one of the carte de visite photos I recently scanned was the name of a Sydney based photographer J. Hubert Newman. Newman operated from several locations throughout his career and I thought it would be an interesting exercise to try and use the digistised newspapers on Trove in an attempt to help narrow the date range for this photograph. In 1867 Newman advertised in The Sydney Morning Herald that he had terminated his employment with the firm Oswald Allen (late Bradley and Allen). The same advertisement mentions his gallery which was located at 53 South Head Road. It is not until the beginning of 1870 that Newman moves closer to Hyde Park at 12 South Head Road. From my research, it appears that all subsequent newspaper mentions of Newman's studio during 1875, list his address as Oxford Street. In July he is advertising for a "Respectable boy", then in August Newman is mentioned in relation to his entries into the Melbourne Intercolonial Exhibition of 1875. Newman is again mentioned when the results for the photography section of the Melbourne Intercolonial Exhibition are announced in October 1875. 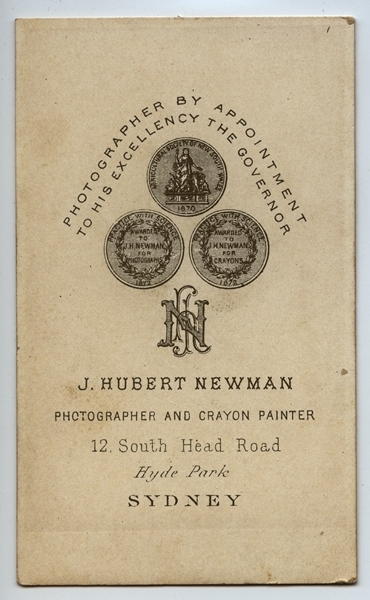 Achieving a first placed medal for his photographic portraiture - interestingly Newman's address is given as 64 Oxford Street. During the Easter holidays in 1881, Newman notifies readers of The Sydney Morning Herald that he would be closed over the break. The address given in this instance is 12 Oxford Street. Taking the documentary evidence into consideration, it appears that the photographer John Hubert Newman carried out his business at his studio located at 12 South Head Road, between the years 1870 and 1874. In regards to dating the photograph in question, and based on the additional of the medals listed on the back of the photograph, the years could be narrowed down to 1872-1874, or 1873 ±1 year.